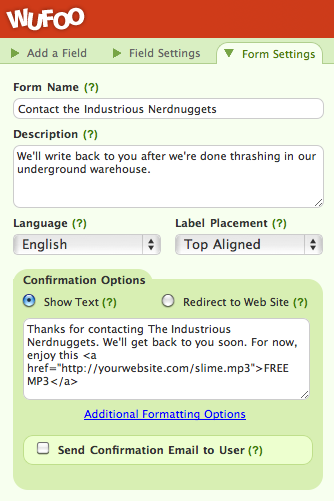 Share files with your coworkers after your customers upload them to your form. Give away a free eBook after signing up for a newsletter. Putting the download link in the message as shown above is nice because it’s available to the user immediately. It can be fleeting though. If the user closes the window before clicking that link, it’s gone. Instead you could put the download link in the confirmation email (or, of course, both places). The advantage of the email is that the user will have a place to reference that link as long as they can access that email. To the download link to the confirmation email, click the Send Confirmation Email to User link the Form Settings area while editing the form in the Form Builder. 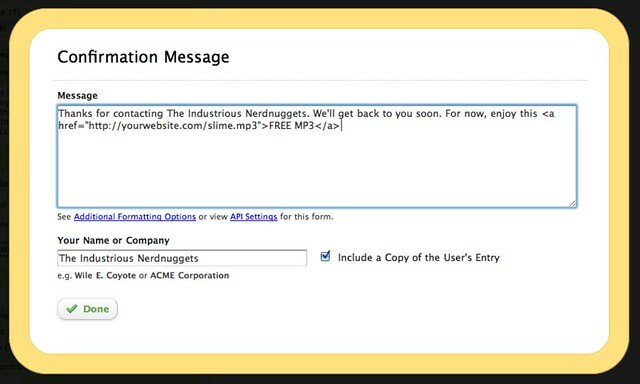 Then click the Customize Confirmation Email button, which will open a popup window where you can customize the content of that email. In the textbox there, use the same HTML code as above. Where can I host my files? CloudApp and Droplr are little applications that live in your menu bar and allow you to upload files right from your computer and get public URL’s to those files. Dropbox is a service which syncs files between your computer and their servers (and possibly your other computers). Files in your “Public” folder have public URL’s to them. What if I want to attach the files in the email? While we don’t have that feature built into Wufoo, if you’ve got a little bit of programming chops, you can check our our really easy tutorial on how to use our WebHooks API to send emails with the attachments straight from your own web server.